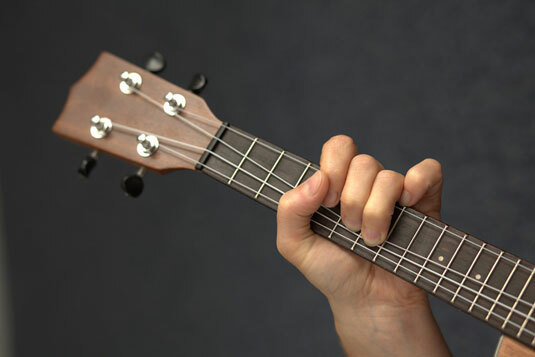 Fret the note with your ring finger and also put your index and middle fingers on the same string. The additional fingers act as support. If you’re playing the g- or C-string, pull it down toward the ground. Bend the string until you reach the target pitch and hold it. Bring your thumb over the top of the fretboard to give you some extra leverage. Check out the bending video to see and hear how it’s done. Bends are a tricky prospect on the uke. Unlike on steel-stringed instruments, the nylon strings don’t take kindly to being bent. Bending notes to get them in tune can be a trial. When you’re practicing bends, try playing the note you’re aiming for before attempting your bend to get a better idea of what note you’re shooting for.